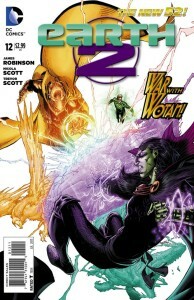 In Earth 2 #12, Doctor Fate is learning how to control the amazing powers granted to him by the Helm of Nabu, while Jay Garrick and Alan Scott provide cover as the battle with Wotan takes to the streets of Boston! This is a much more powerful Wotan than Nabu himself faced so many years ago, so the outcome is certainly in doubt as we rejoin the battle as this issue begins, continuing one of the best series that DC publishes today! This issue of Earth 2 flashes back and forth over recent events, explaining how and why the battle has left the mystical realm surrounding the Tower of Fate. Khalid is reluctant at first to listen to the advice of Nabu when fighting Wotan. But given the power levels they are now facing, Khalid and Nabu reach an understanding of how to access the amazing powers of various gods to fight this menace. During the fight, Green Lantern arrives to assist, having been called away by the power of the Green energy from his investigation into Sam’s death. His timing is critical, as the World Army has arrived to take everyone down! Jay and Alan provide cover while Doctor Fate and Wotan battle with hexes and spells in the skies above Boston. To see how (and even if) that resolves, you’ll need to pick up the issue. One other note: Jay is fully outed as The Flash, which places his mother not only in danger from Flash’s enemies…but also in danger of arrest by the World Army! Alan Scott provides the solution – housing for Jay, his mother, and Khalid in his broadcasting company’s HQ. We may be moving closer to a New52 “official” JSA HQ here…but not quite yet. There is another battle to fight – and this one promises to put everyone to the test! James Robinson turns in another excellent script for Earth 2, with Nicola and Trevor Scott on pencils and inks and Barbara Ciardo and Pete Pantazis on color. The artwork is superb throughout – and the more I see the design of the New52 Doctor Fate the more I love it. This is an exceptional design that draws upon the rich history of the character while adding new detail that fits excactly with the nature of a mystical Doctor Fate. As I keep saying every issue, this is one of the very best series DC has in their lineup today. If you aren’t reading Earth 2, you are truly missing out! This entry was posted in Reviews and tagged Alan Scott, doctor fate, Earth 2, Flash, Green Lantern, Hawkgirl, James Robinson, Jay Garrick, Kendra, Khalid on May 1, 2013 by Ed Garrett. One minor but noteworthy detail – the lightning bolt emblem on Flash’s uniform now ends at the red section, no longer extending into a stripe on his leg. The change came about when he magically repaired his costume. I haven’t read the series since issue 6, but during that entire time (even within the same issue), Jay’s costume kept changing in the details. For example, first there was red on his sleeves, then it was all blue, then back again. It was never consistent. It drove me bonkers! lol!